We ask a dietician - just exactly how are acai bowls healthy? Are acai bowls actually healthy? A dietitian delivers her verdict. Everything about an acai bowl looks healthy, the nuts, muesli and the pretty fruit on top all make them very ‘grammable– but are they actually as healthy as we’re told they are? If you haven’t already seen one on social media, acai (pronounced ahh-sigh-ee) bowls are a beautiful looking purple puree of blended acai and fruit, topped with luscious looking ingredients including granola, peanut butter and more fruit. Acai bowls rose to fame for not only being delicious-looking, but also due to potential health benefits. Acai has been reported to be high in antioxidants, improve cholesterol levels, boost brain function and even have an anti-cancer effect. But how do they really stack up? Innocently enough, the acai bowl does contain a mixture of healthy, natural ingredients. There’s potential to get a serve of fruit or two, some heart healthy fats, if topped with chia seeds or nut butter and some wholegrains if the granola used is oat based. The acai berry is in fact, legitimately high in nutrients and a strong source of antioxidants. Acai berries contain almost ten times the levels of antioxidants found in blueberries. Antioxidants help to improve heart health, aid in digestion and prevent against ageing and inflammation. Acai Berries are also low in sugar and high in fibre, so when we look at the fruit alone, it holds great potential. The unfortunate thing is that acai comes from the amazon and is highly perishable, so it is often pureed or powdered and mixed with sugar to prolong its shelf life, this means that some of the phytochemicals, fibre and health benefits of acai are compromised in the process. I swear we have other açaí bowls on the menu!!!! But, the mac nut bowl is DEFINITELY the most ordered bowl of all! I make all the rawnola, mac nut butter, raw cacao drizzle + nut mylk used in these bowls daily. Fresh is bestest am I right?! I truly believe that making all these things on the daily is what keeps you coming back for more ???? Can’t forget I also use premium organic unsweetened açaí by @tamboracai Seriously the bestest açaí on the planet ???? All these ingredients really just make this bowl next level. Thank you to all of you that wait so patiently for these magical bowls when I’m slammed with mega orders! You are the sweetest!!! ???? Given the main ingredients are often apple juice, fruit, acai puree and granola, you’re looking at a heavy carbohydrate hit, with up to 50g or 10 teaspoons of sugar (AKA over 90 per cent of the recommended daily sugar intake) in one serve. Even though most of this sugar is naturally occurring fructose from fruit, there’s still too much sugar to justify the nutrients and antioxidants you’ll also get. Consuming such a large amount of sugar in one sitting can cause large spikes in blood sugar levels, interfere with your mood and then lead to an energy lull soon after. Unfortunately, acai and smoothie bowls are incredibly energy dense. Since acai bowls are predominantly fruit based, they’re mostly sugar and simple carbohydrates, low in healthy fats, low GI carbs and protein. Being so high in carbohydrates and lacking in protein, the breakfast will be rapidly broken down and absorbed by your body, making it difficult for the meal to keep you full until lunchtime. 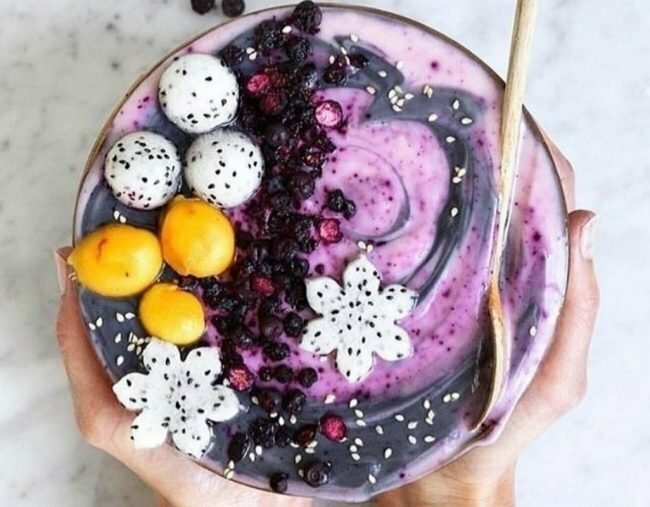 Calorie-wise, acai bowls can vary greatly, but most are roughly between 500-600 calories, translating to 20-25 per cent of your recommended energy intake. Another dangerous trap of the popular smoothie bowl is the large portion size you’re served up without really realising it. When the acai puree and fruit are blended together, fibre is broken down and lost, so it won’t keep you as full as if you ate the fruit whole. There’s also no chewing which happens as it’s already pureed for you. Chewing food slows down the speed at which you can eat, signals to the brain that you’re eating and affects the way your digestion hormones are released. So basically, since acai is pureed, your body has less time to process and signal fullness, often resulting in overeating. It’s awfully tempting to add on toppings, but this might be doing more harm than good. Adding on granola and dried fruit will skyrocket the calories and sugar level of the meal. Dried fruit is also high GI, meaning the carbs are quickly absorbed by the body, causing a spike in blood sugar levels. Consider going sans toppings to keep the calories lower or adding in some natural nut butter (peanut or almond) for a serve of healthy fats and protein, but once again – remember that whilst these are ‘healthy’ they are still high in calories, so watch the serving size. Ultimately, whilst these smoothie and acai bowls are undoubtedly photogenic and great for the ‘gram, they don’t really stack up nutritionally. At over 500 calories and 50g of sugar a pop, there are much more nutritionally sound breakfast alternatives out there. I’d recommend you consider them more as an occasional treat or something to share, but don’t rely on the humble acai bowl for a sole ticket to better health. Has this changed the way you view acai bowls? Tell us in a comment. Just for a little fun, we quiz team Mamamia on some famously hard to pronounce foods. Here’s how we went.